(15nov06) This issue will complete the capsize essay. The 1 December issue will speculate on power requirements.. Mart's down under Scram, right side up. Looking almost done but don't forget my old buddy's warning, "The first 85% of the project takes just 15% of the time!" In the last issue I presented an essay about knockdown recovery demonstrated by Herb McLeod with his AF3. This year Max Wawrzyniak completed an AF3 in St. Louis not far from here. One weekend we went out for a boat camp at Calylye Lake. On that Saturday there was no significant wind and we decided to take advantage of the calm conditions by doing a practice capsize of his AF3 (shown below with a classic 2hp Neptune mounted). On reason I was looking forward to the test was to scope out the situation which Norm Wolf ran into with his Normsboat where the capsized boat floated nicely on its side and was easy to right but had its centerline slot pretty close to the water. Here is a photo of the situation. Few knockdowns happen in calm conditions of course, and that open slot might look inviting to a large wave. 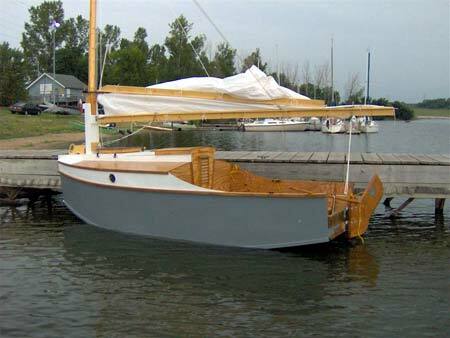 When I made the first boat like this about ten years ago, a Bolger Jinni modified to have a small slot top cabin, I was careful to add segmented hard covers over the slot when sailing in rough conditions. I never capsized that boat and can't say how it would have done. But I feel the slot was covered sufficiently to minimize the effect of waves. I did similar designs like Pencilbox and AF2 and showed the plywood slot covers on the drawings but none of the builders built them. I'll admit that hardcovers are a pain. Eventually everyone moves towards soft covers and that is what Norm and Max use. I'm not sure how effective a fabric slot cover would be in keeping the waves out but I'm pretty sure it would be a lot better than nothing. Remember that the cover is not supposed to keep the water out for hours but just for a few minutes while the skipper swims around and rights the boat. For any slot cover, the mast is something of a problem in that it is mounted on the side of the slot and would need to protrude through the cover if the cover were used while sailing. It was fairly easy to make a slot it my plywood slot covers. I think someone handy with a sewing machine could do the same with a soft cover but that is only speculation. Here is what we did. The AF3 was beached and we removed the motor and all the loose things, although Max is much better at secure stowage than most of us. The boat was walked into waist deep water, parallel to the shore, and anchors run out from the bow and stern. The halyard was secured to the mast and its free end given to me close to the shore. So I could pull the boat over with the halyard while the anchors held the boat in place. 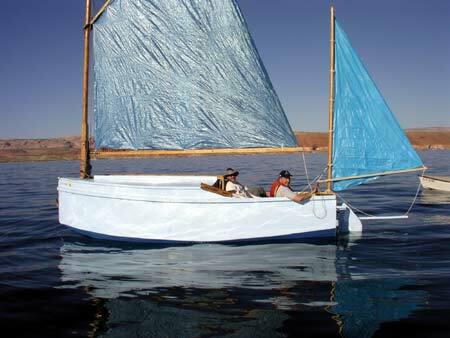 The sail was stowed to keep tangles to a minimum but the sail and boom can have an effect on the result. 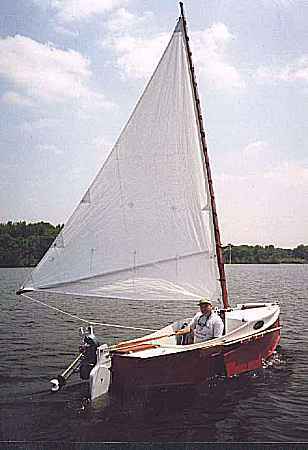 I would expect the boat would be slightly less stable due to the weight of the sail and boom up high. 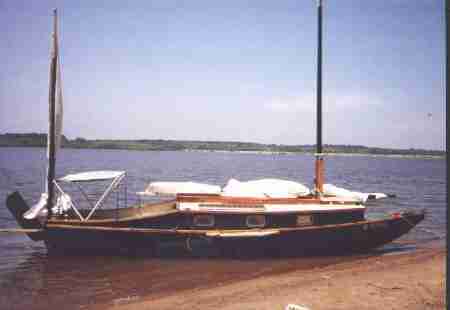 Once the boat is knocked down the boom and sail can help float the boat and keep the boat from going turtle. 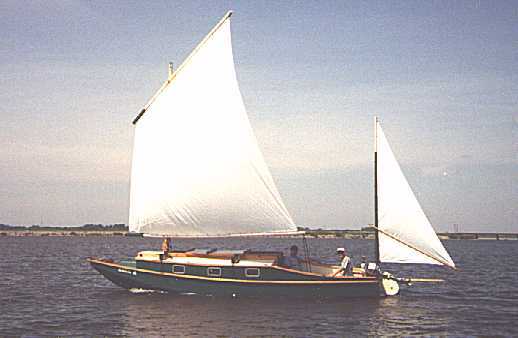 In fact that effect is really strong with a lug sail who's yard acts like a float out on the top of the mast. 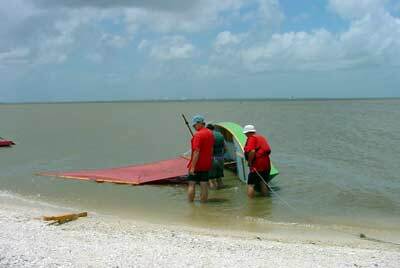 Then when it comes time to right the boat it is very very important to totally release the sheet because if water pools in the sail as you try to raise it off the water the weight of that water can make the boat much harder to right. (There can be other effects. Remember wind surfers? You never see them any more but 15 years ago they were all the rage. One day I was out sailing when a young woman fell off a windsurfer nearby. She climbed back on and raised the sail with the rope. "Did you see that!" she exclaimed. "What?" says I. "There were five fish in that sail when I pulled it up!" says she.} 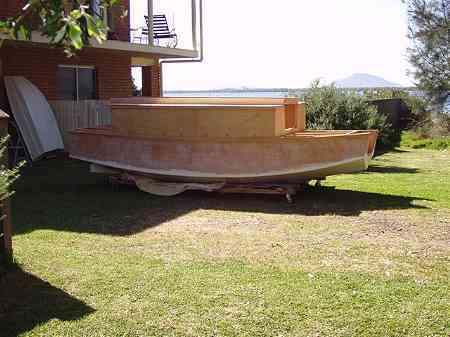 And don't forget that if you raise the boat upright with the sheet tight that boat might sail off without you! Max sat in his boat in his usual sailing position while I tugged it over. He has a tilt angle indicator on his bulkhead although it maxes out at 40 degrees, I think. I pulled it over and thought in a subjective way that the maximum righting force came at about 20 degrees which is what I expected. Almost any unballasted sharpie seems to behave like that. I continued to pull until the cockpit coaming was about to go under and flood the cockpit. Max said that was at about the limit of his gauge, 40 degrees. 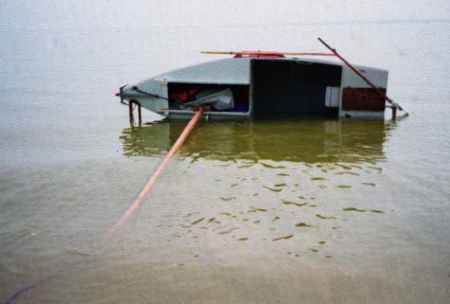 I was surprised that the boat still had substantial righting ability at that point unlike my old Jinni which capsized twice in tis career, both times it seems like way before any water came over the rail. But the AF3 was still hanging in there and you might be able to recover right up until then. Max had covers over his oarports which leaked slightly - a good indication that it is time to release the sheet although I can't imagine anyone seriously sailing one of these over 20 degrees of heel in a regular way. Next I released the tension on the halyard so the boat rolled back upright. Warning! If you ever do a test like this give the skipper lots of warning because the boat rolls upright very quickly and the ride inside the boat can be rather violent! Max righted the boat in an instant. He said there was nothing to it. Norm said there was nothing righting Normsboat and Herb said there was nothing to righting his AF3. 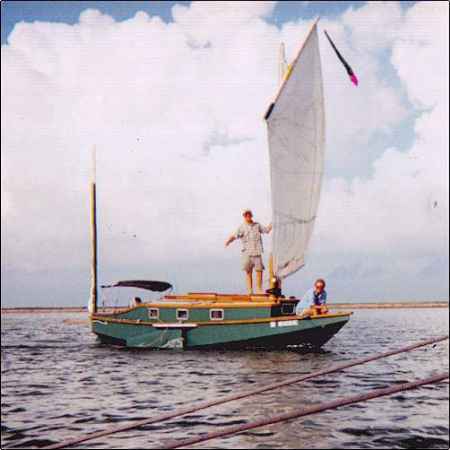 Once righted Max climbed back into the boat using the step hole he had cut into his rudder. 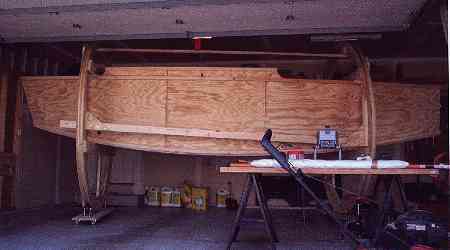 It worked very well and I am going to show such a step hole in all future boats. The hole has no noticable effect on sailing. Max bailed it out and that takes a while. There was no water in the cabin or stern locker but it was maybe 6" deep in the cockpit. In a real capsize this would be a critical time since the water in the flooded cockpit would roll around with each wave and make the boat a lot less stable. 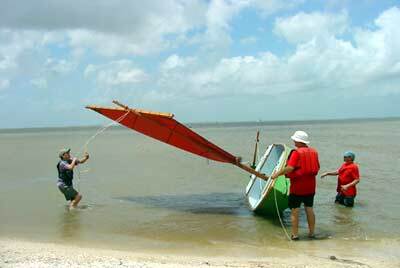 It is important to have a good bailing bucket handy and secured to the boat if you are sailing in capsize conditions. 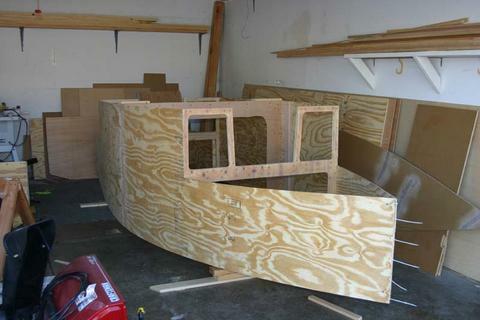 When it was all squared away we capsized it again so I could get an idea of the effort needed to right it. Not much required. With Jinni it took my weight on the leeboard to right the boat but with AF3 I never got that far. 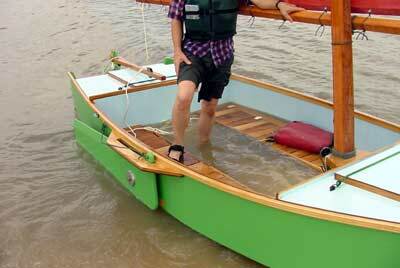 When I waded around the stern I grabbed the chine and pushed on the bottom and up she came. I'm going to draw a narrower slot in future designs and go back to showing the plywood slot covers. One question I have to ask myself is if a bit of added ballast will make these designs self righting. Not with the crew inside because that can be a very difficult situation to scope out in every way, but with the empty boat righting itself after the capsize and the crew is swimming. Then the boat self rights by itself before waves have a chance to flood into the slot. 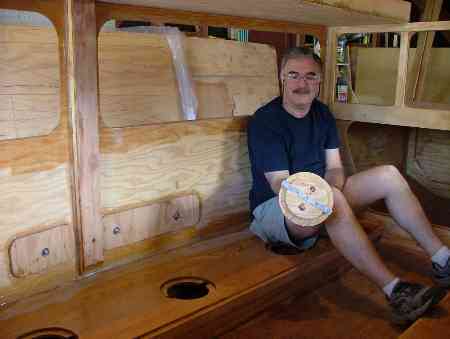 The crew doesn't need to swim except to get to the rudder toe slots and back into the boat. Then it is bail time. From what I have seen the amount of ballast needed might not be much, maybe less that 50 pounds. Maybe less if the weight is mounted on the tip of the leeboard. 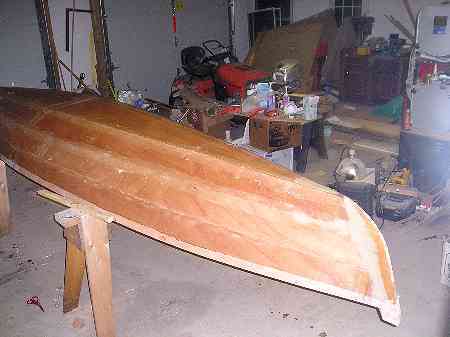 But you can't always plan on the leeboard being down and the tip ballast might make the board very hard to pull up. You can of course see a great danger in such a boat in that it might sail off without you very quickly so on second thought it isn't such a good idea. 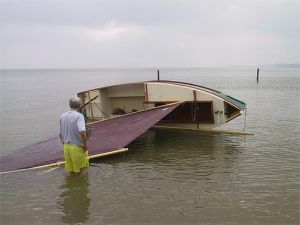 Then again, that situation is no different from the present where you must have the sheet loose and have a good grip on the boat when it pops upright. But it would not be a major effort to find out. I might check it out using the Hullforms program but even better would be to wait until the warm water returns and Max gets bored with sailing on a calm day. Then we haul it over again and see how much weight is needed to make it right by itself. Luckily Max is a good sport. It's hard to tell, but the bottom drops off quickly here and the boat never touched. Sometimes it looks like it might be sitting on the bottom, but it was happily bobbing in the waves even when completely on it's side. It took a surprising bit of effort to pull the boat over even though it was entirely stripped of gear. Once on it's side, the boat floated on the yardarm with the hull high in the water. That is the tiller in the air since the rudder flopped to starboard. Now I start to try to bring it back up. I probably should have done it the other way so that I could have pulled the leeboard, but I guess in a real knock-down, you don't get to choose. ...and hanging onto the gunnel, easily tipped the boat back upright. I tried to simulate getting back in the boat in deep water by bending my knees and pulling myself in with my arms only. This was surprisingly easy. There was a bit of water in the cockpit, but that was easily bailed. I think the boat would have sailed that way unless it was very brisk. Skip Johnson helped me bail the boat out. The hatches were built a little oversized to accommodate an ice chest (yes, we are spoiled) but only leaked a few tablespoons of water into the flotation chambers. Now we pack our gear in dry bags when we go cruising." 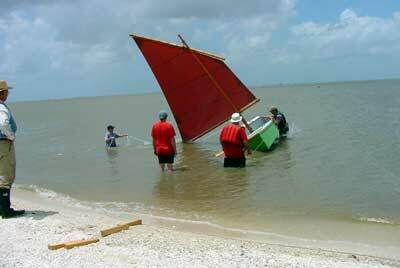 ...Practice a capsize until you can right the boat and get going again. 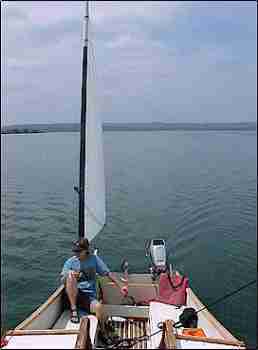 Practice usually happens in mild conditions and in real capsize conditions things will be worse. 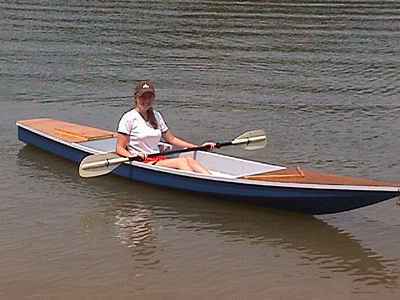 Then again the fear factor in a real capsize will help your strength and quickness. ...Make sure all your gear is well secured. If not you will lose it. In this catagory would be important boat parts like your rudder and mast, both of which may leave your boat if not well secured in position if the boat is sideways or inverted. ...Keep bailing equipment handy and secured to the boat. I think that a couple of scoops made from gallon jugs might be best, one tied to each side of the hull so you won't have to reach across a flooded boat to get a scoop. Should be large enough to bail a good amount of water with one hand because you will need the other hand to hold on to the boat. Should not be so small that it will take a long time to bail. ...Give a lot of thought to righting and reboarding the boat. I would suggest having lines that allow you to pull down on the wale from the bottom even if you can't reach the wale or stand on a leeboard. Also seriously consider the slot in the rudder to give a toe hold to reboard. 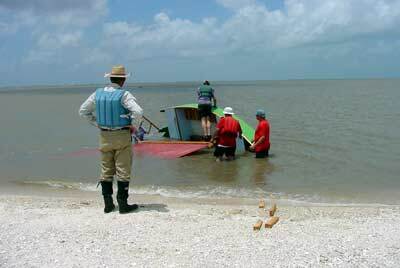 Most smaller boats if swamped will be too unstable to reboard over the side - the water in the boat will slosh towards you as you try to hoist yourself over the wale, recapsizing the boat.